Oxford Assess and Progress is a new and unique revision resource for medical students. Written and edited by clinicians and educational experts the series provides an array of popular assessment questions and extra features, including bonus online questions, to be truly fit for purpose and assessment success! Medical students will benefit from a comprehensive selection of Single Best Answer Questions and Extended Matching Questions designed to test understanding and application of core medical topics. Key professional themes such as decision making, communication and ethics are also teased out to ensure complete revision coverage. Editorials in each chapter unlock difficult subjects. Ideal companions to the best-selling Oxford Handbooks these excellent self-assessment guides can also be used entirely independently. Oxford Assess and Progress: Clinical Specialties doesn't simply reveal the correct or wrong answer. 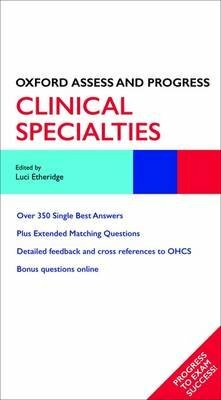 Readers are directed to further revision material via detailed feedback on why the correct answer is best, and references to the Oxford Handbook of Clinical Specialties and resources such as journal articles. Each question is rated out of four possible levels of difficulty, from medical student to junior doctor. Carefully complied and reviewed to ensure quality, students can rely on the Oxford Assess and Progress series to prepare for their exams. Colour illustrations 59 colour photos Online Resource centre www.oxfordtextbooks/orc/Etheridge/ Artwork from the book A link to the Oxford Handbooks updates page Bonus questions will be released monthly in the run up to final medical examinations.